When it comes to spreading the word to create more business, Bernice explained, “We very rarely advertise—all our customers are by word of mouth, or are loyal customers who keep coming back.” As I listened to this high energy “salt of the earth” couple describe all that goes on everyday, I was struck by what make their Plaza unique. For starters, the businesses located at the Plaza offer a unique service unlike others. The impressive list includes, Kingston Kabs Car Service, K9 Crazy Playskool Dog Training, W. E. Bryant's Towing & Repair, Self Storage & Container Rentals, Pre-Owned Auto Sales, Graphics & Sign Making and recently; they've expanded to include Embroidery. As Darryl and Bernice explained the Plaza’s history and the entrepreneurial energy so critical to oversee all that goes on, I began to grasp how their families’ background-- with all the services they offer-- has played a notable part in helping build our shared communities, as you’ll soon read. Moreover, the Reservoir Food Pantry has witnessed the Deitz attention to customer service first hand. Our organization is now the proud owner of a beautiful, super sturdy cargo van used for weekly trips to Latham’s Food Bank! 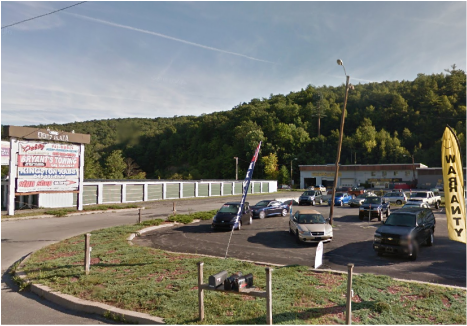 So--how exactly did the Deitz family start this impressive collection of businesses on Route 28 anyway? Back in 1953, Darryl’s father decided to invest what little he had, into something worthwhile--something he hoped would create long-term security. After several years of overseas military service and some local fruit picking to make ends meet, Burt Deitz Sr., born in Binniwater, NY, opened a Mobil gas station with only $300 in his pocket. This decision required both faith and ambition, as this location was the first and only available gas on the throughway. He stayed open 24 hours a day and drew solid business from locals, skiers, and tourists year round. As the sole proprietor, the work required excruciating long hours and dedication. Overtime, he developed a stand out reputation due to his straightforward values and high standard of service. During these early years, he also included towing —which is an important piece to the later Plaza expansion. In 1957, Burt married his wife Joan; a professional barrel racer, horse trainer and skilled rodeo competitor; who later maintained five horses on their Gallis Hill property. As the years went by and the family matured, Burt Sr. began to train his sons to help out at the station. The Dietz offspring from oldest to youngest are Burt Jr., Dean, Debbi, Darryl and Gregg. By 1968, Burt Sr. slowly bought pieces of property on Route 28, which are still part of the current Plaza boundaries. Soon afterward, he also opened a Napa Auto Parts store in 1971, which closed in the late 2003 due to larger commercial names taking over the market. In 1984, always looking to grow and generate security for his family, Burt Sr. purchased Bryant’s Towing for his son Burt Jr. The tow business had been located on Kingston’s Albany Avenue and was immediately moved and added as part the Plaza. But within a week of this new venture, as Burt Jr. was in the midst of learning radio dispatch commands for the NYS Thruway calls, he was struck by another vehicle while responding to a Thruway call which almost took his life. The accident was traumatic enough that Burt Jr left the business for three years. But after recovery, he returned to Bryant’s Towing full time, and has remained the dedicated owner and manager for the last thirty years. During the past 25 years, Bryant’s Towing provides official classes ten times per year with local fire and police departments. The classes include training police dogs, setting up mock accident scenes, and staging fires complete with hoses and extensive gear. Deitz Plaza was chosen and remains ideal for these trainings because of the property’s expansive layout. And, due to Burt Jr.’s collective experience, he understands the necessary protocol these agencies require. Also, on top of all of these specialized classes, Burt Jr also teaches other New York tow companies radio commands, towing vehicles, and working with specific equipment concerns. But on a very sad, shocking note, and in spite of so much to be grateful for, in 2003, the Deitz family found themselves facing a tragedy. While living in Florida with his wife Joan, Burt Sr. passed away very suddenly due to a rare form of cancer. This was a profoundly devastating time, and now, twelve years later, the family still deeply grieves the loss of their father. Bernice remarked sincerely about her father-in-law “He was such an exceptional man; so honest, with so much integrity. It was terrible to lose him so fast. I never thought we'd lose him.” But with strong family bonds and support, the Deitz’s manage to carry on and maintain the businesses—but it’s never been without some degree of challenge and on-going perseverance. and with the help of a friend, he learned the basics of commercial graphics and took the leap to start this new business. He opened the doors for this venture to design signage, t-shirts, vehicle lettering, or any surface that can display a logo or visual concept. He loves the creative aspect and now enjoys a well-known client base. The latest exciting addition to the Plaza is Stucki Embroidery Works, Inc. The Plaza gained four great people from Stucki; to include, Emilia - Office Manager, Kimberly - Embroidery Specialist, Griselda - Tailor/Seamstress and Lucas - Screen Printer; all of whom generate meticulous, exceptional work. . Darryl explains, “People come see us because they specifically want their product to be made in America.” Our clients include regional fire and police departments. Bernice related how a design goes from concept, to digitizing the artwork into thread count to a finished product and that the result is often like a work of art, “Embroidery needs to make a come back. It is a very special way to create something beautiful and long lasting.” It’s not a stretch to imagine how the results are stunning and extremely well executed. As if all the aforementioned wouldn’t be enough to keep the entire family sleeping with their shoes on Deitz Plaza also rents shipping containers for construction sites. It became quite obvious in the course of this interview how this family actively assists so many from so many different walks of life, and provides the service and support necessary for individuals to work and survive in this region. These types of products and services-- delivered with honesty and courtesy-- are so very important in our rural area. With all these ventures percolating constantly for Darryl, Bernice, and Burt Jr., not to mention the rest of the Deitz’s, what is family life like for them? Presently, the whole tribe lives on the Gallis Hill property originally purchased by Burt Sr. Darryl and Bernice have two daughters, Olivia, ten, Lorelei, eight, and a little son, Logan, two years old. Although the children are still very young, I asked if there is any degree of hope that one day, one or two of them will carry the torch for Deitz Plaza. They both expressed it would be completely up to their children and they will never apply pressure toward this direction, partly due to the intense commitment involved. Darryl explains, “The business takes a very heavy amount of work; 7 days a week 12-14 hours a day. You can’t really have any degree of success without dedicated, committed, long hours. But we’re not complaining at all. We have a great life and we’re very happy.” Of course, the Deitz’s enjoy an occasional get-away so they can recalibrate and spend quality family time together. I asked Darryl and Bernice if there’s anything they’d like to express to sum up the remarkable timeline of their background. Without missing a beat they’d like to express a heartfelt “Thank you!” to all their loyal customers, with Bernice adding, and Darryl nodding in agreement, “We are genuinely dedicated to doing good work, and seek to create a positive experience for everyone we do business with.” In my book, that’s a real promise born from authentic commitment-- from one amazing local family. After a swift exit off Highway 209 into the center of Hurley, encircled by a crisp autumn sky, a serene white steeple guided me easily to the Hurley Reformed Church. After pulling into the tree lined parking area, I looked forward to hearing a slice of rich New York history related by Pastor Robert Gram. With the midday bells beginning to peel, I soon found myself past the front threshold and listening to a fascinating timeline of the very earliest days of this very proactive Christian community. In talking with the Pastor, I also discovered how this neighborhood church connects to a much larger principle of service that’s more about the business of giving—not necessarily religious doctrine. But first, let’s have a look at the church’s unique history-- something most of us deeply appreciate in this very special region. The church’s earliest days began in 1670, but these beginnings were not in the town itself. Hurley residents would travel three miles to attend services at the Reformed Church in Kingston. Every six weeks or so, the Minister would visit a private Hurley home to conduct sermons locally for the villagers. Eventually, after several attempts, a request was made to establish a new church for the town under the Dutch Reform of America. In 1801, this request was finally granted for the people of Hurley. Construction of the original one room stone building began and was designed for a capacity of 250 people. Overtime, the building began to have a structural issue; a large crack developed that continued to widen. As the issue became worse, a decision was made to tear down the entire structure to construct a brand new church. In 1839, the Crispel family sold 1.5 acres of property on Main Street, which included a stone cottage, and large Dutch barn. The stone cottage housed the minister and became a busy parsonage for all manner of church functions --this included regular services, weddings, and funerals. The funerals were conducted using a “dutch door” on the lower half of the entryway. Coffins would be passed through this special portal to avoid inhabitation of evil spirits to the parsonage. After some time, the site of the adjacent barn on the property was selected as the next site for the church. Completed in late November of 1854, the first service was held on December 3rd of that year. The church has been a special beacon to the town since, with Pastor Bob Gram at the helm since 2008. Pastor Gram has also brought a rich and interesting background to the town of Hurley and the Christian community. He was born and raised in Spring Valley, New York. Blessed with a natural well roundedness to his religious calling as a boy, he participated in wrestling, and what became a longstanding interest in rock music. During these early years, a local minister who was active in the Civil Rights Movement profoundly influenced his direction. Through real life observation, he found himself deeply inspired by missionary work that held no lines of socioeconomic division and so; later felt called to a religious education. He attended Concordia College in Westchester and then went on to earn his masters degrees through various prestigious seminaries, such as New Brunswick, Princeton, and San Francisco Universities. After graduating from these programs he went on to serve in several Reformed Church of America congregations over subsequent years. He also holds degrees in social work and psychotherapy from Columbia University, and has done extensive work as a drug and alcohol counselor. Also a published author, he wrote “Unmasking the Illusion Of Death” a book released in 1985 in response to the work of Elizabeth Kubler Ross, as well as having published over 100 articles and short stories, and has been awarded first place for featured writing. Pastor Gram also gives lectures locally in Kingston, at various venues, on selected Christian literatures and related topics. The church’s congregation count is approximately 150 people, along with a lively youth group. While the Pastor remarked they are primarily an older community, he also expressed they also have loads of energy for community service efforts and large celebrations, “They just threw a big party for my 40th Anniversary of my ordination, with my favorite rock band, The Stillwell Project!” I noticed just in this meeting with Pastor Gram, the feeling of boundless creative energy that resonated in our discussion. After hearing the impressive list of organizations and emergency efforts the Hurley Reform Church has provided support for; I realized their devotion for service extends far past their front door. Pastor Bob underscored the church’s cornerstone intention is to select ongoing monthly missions for all manner of causes, such as hurricane relief, focused giving to various food pantries-- this included making the Reservoir Food Pantry a monthly mission focus this past year, as well as support to other social service efforts including Family of Woodstock, Habitat for Humanity, Caring Hands, Hospice organizations, and a long list of others that have steadily accumulated over the years. The Hurley Reform Church is a essentially a traditional congregation, so with secular service given to not only their immediate region, but on a national level as well, this is a stand out Christian community. In spite of having to fundraise and keep the church’s budget well balanced, they truly accomplish a great deal on a continuing basis. The church building is also used for outside support efforts, as well. Al-Anon (family and loved ones of alcoholics), and Alcoholics Anonymous meetings meet in the church regularly. Pastor Gram also shared how his psychotherapy background has been useful within the church, and often somewhat informal. Rather than official appointments for those who seek his assistance, he’ll simply hear a knock on the door. In spite of all his endeavors, he tries to help as many as he possibly can, while seeking to follow through with other broader charitable duties and commitments. The church calendar in and of itself also does not rest on it’s laurels; throughout the year the Hurley Reformed community is bustles with various functions such as Quilting, Fish Fries, Fiddle Fests, and youth group activities, just to name a few. No matter the season, the church is a continuing vibrant, colorful, and generous asset, on so many levels, to our area. Activities are available and welcome to anyone who would like to participate in anything the church has to offer. http://hurleyreformedchurch.org. or call 845. 331.4121. As I circled my car into the main parking area, I felt both curious and relaxed by the natural appeal of the church property—which is celebrating its 40th anniversary this year. The clean and well cared for house of worship waits serenely on the side of Dubois Road in Shokan, and blends in quietly with the surrounding neighborhood homes. Going up the front stairs, I continued through the generous double wood doors and was warmly greeted by Doreen McCutcheon, wife of Pastor McCutcheon. The immediate entrance frames an inviting, spacious hall that easily encourages worship. Visitors will find themselves drawn toward the high, brightly toned log cabin walls that surround ample rows of comfortable seating. The Pastor's podium waits underneath a stately, artistic stonework cross left in tact from the original building design. To the left, is a full drum set with keyboards and guitar that wait to pull musical duty at the next Sunday service. Praise-inspiring music is a regular feature and usually led by Pastor McCutcheon on guitar and keys, along with several volunteer members from the congregation including several vocalists and guitar players. His two sons play drums and bass. Pastor McCutcheon’s role began at the Wesleyan church in 2010. For 20 years prior, he had been on staff with larger churches in various roles such as Worship Pastor and Youth Minister. After deciding to resign from a church in the state of Indiana, he soon had an unprecedented spiritual shift before deciding to come to the Shokan area. Curious about the Pastor's religious background growing up, he told me he was born in Ontario, Canada and is now a U.S. citizen. He has three brothers—two of whom are also pastors. His father was a real estate agent and ran a small farm, but shared experiences with his sons that helped inspire them to pursue a spiritual life. August of 2010, after sending his resume and preaching a sample sermon, Andy was voted and approved for his new role as head Pastor. Upon arrival the McCutcheons and the Wesleyan congregation needed to face a challenging project. The building needed care. There was cumulative damage resulting in the need for serious renovations. Woodpeckers and bees had created substantial holes in the log cabin style building, which lead to the current, and very natural looking vinyl siding. All the refurbishments on the building have been completed within the last two years thanks to focused fundraising efforts. These changes were recommended by a church consulting team, hired to come and assess the current needs of the church as a whole, to culminate in affective change, equipping the church to fulfill it's purpose. Pews gave way to padded chairs to create the main hall, giving greater functionality for varied functions and events, such as for banquets, children's and youth events. New bathroom fixtures were installed as well. The Pastor went on to explain how the live music played every Sunday is vital to being culturally relevant. The pastor describes services at the church to be typically high energy; filled with live music and authentic enthusiasm for Christian teachings. The McCutcheon family is blessed with three sons and a daughter. Together, with the support of their community minded congregation, they have generously gifted the Reservoir Food Pantry with both funds and food donations on multiple occasions. It was crystal clear as we completed the interview, that the townships of Shokan and Olive are very fortunate to have Pastor McCutcheon and his family in our midst. If you, or anyone you know, have interest in attending their inspired, lively services to share in the word of Jesus Christ, don't hesitate to spread the word or walk through their front doors. (shokanwesleyan.com) Plenty of soul-soaring music, joy-filled praise, thoughtful prayer, and opportunity to share and meet others, with no pressure whatsoever for anything beyond these positive, life enhancing intentions, will be waiting for those who come to partake. As he stated so genuinely at the start of our interview, Pastor McCutcheon, his family, and his congregation, seek to give— not gain, from those who come their way. Celebrating, sharing, and applying the word of God to those who desire it, is the basic foundation built by the wonderful people, right here, just down the street, at the Wesleyan Community Church in Shokan, New York. On road trips, most of us can tell with a quick glance at an eatery or bar whether we feel welcome to walk through the door. The place may project a “locals only” image that doesn’t invite newcomers to stop in for a meal or simply hang out with a beverage. After 45 years, history tells us this is not the case with the Boiceville Inn. Situated on the shoulder of Route 28, the tall, friendly white letters that spell out the name and the rustic wooden door casually call out for anyone to “come on by.” And when you do come inside, not only can you instantly relax and order from a hearty menu, drink a beer or cocktail, or maybe play a little pool and enjoy yourself—you also get the sense you’ve walked into the local heart and soul of the town itself. Perhaps the reason for this is because John and Barbara Parete, along with Barbara’s brother, Pete Tosi, (and with the help of friends and neighbors), built the restaurant from the ground up, back in 1973. Barbara was raised in Boiceville and John had lived most of his childhood in Stone Ridge. As newlyweds in 1964, they began their life together on Boiceville’s Piney Point Road. Overtime, John became well acquainted with the larger Olive community (Boiceville comprises one of the five Olive hamlets). John and his brother-in-law Pete, wanted to get into the restaurant business and aimed to just “buy a Cadillac” after making a decent profit. So in 1970, they opened a small restaurant where the Landmark Inn is currently, on Route 28. In these early days, John recalls, ”We agreed it was a cool business for us because we both liked people and community. Pete was on the Town council and the school board.” After a successful run in the first location for three years, they realized they wanted to design their own restaurant large enough for community meetings and possibly live music, on occasion. They also wanted a full service bar and menu, and a location situated well out of the way out of the flood plane. So, design it -- they did. Looking back, I asked John if his involvement in local politics was at all a surprise to him, he said, “My family has always believed in the political process. My parents taught me that if you don’t get involved you have no right to gripe about what’s happening. And politics doesn’t have to be a bad thing. The division we have between parties though, is really unnecessary.” As I listened to John talk, it seemed pretty obvious that he’d rather cultivate connection between people rather then hold a party line. Local recreation for Olive has also been a highlight focus for many meetings. Right under the roof of the Boiceville Inn, the Little League and soccer leagues were formed and started. The local memorial swimming pool was also named after his brother in law, Pete Tosi, who was on the town council for many years. Also, right in line with these same community efforts, John and Barbara are generous sponsors for the Reservoir Food Pantry. They have donated a storage space for our Mobile Pantry site at the Route 28 Water Treatment Plant behind Robert’s Auction on Monday’s between 2pm and 4pm. Because of the on-going assistance the Paretes give our Pantry, they also help to support untold numbers of individuals and families, which of course, is exactly what they intend to do. In years past, John has also helped to freeze poultry for the food pantry in Phoenicia. His family is acutely aware of people that suffer for a variety of reasons in our surrounding towns, who need nutritional assistance. The Paretes clearly hold strong values to help disabled or homebound people who sometimes need extra support toward a better life in our rural communities. 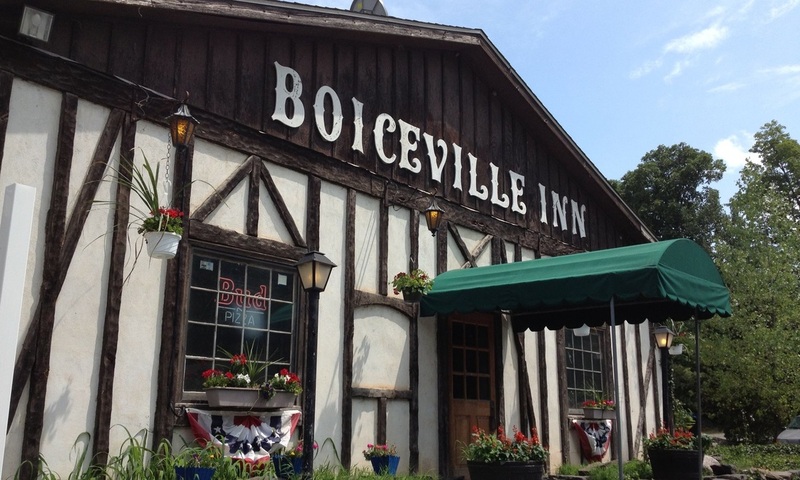 So, with all this good history and solid sense of community, what’s in the future for the Boiceville Inn? So, if your driving by and need to relax, eat, have a beverage, or just talk to some decent folks who may or may not live around here, pull up and park—and don’t think twice about coming through the door. You’ll always be welcome. ﻿Ideally, many of nature’s mechanisms hum along with no need of human attention. But when it comes to producing edibles on a larger scale-- timing, technique, and skill all must come into play. How does a calling to do this work on a community level materialize into a plan that’s functional and satisfying? What looks like a complex undertaking may have started with one person’s subtle, yet propelling urge. Or, maybe a few folks start brainstorming and agree to work toward specific goals. With a little applied focus, we can see how any one individual’s life events, accumulated skills, and “people influences” can later flourish within a greater vision. So, I decided to go on a garden safari. With a tape recorder and journal, I trekked through the lush life of one founder for the Shandaken Community Gardens: Valerie Linet. Like steps on a garden path, I wanted to trace her life experience and discover the various components of her contribution to this mosaic of positive energy. Yet, Valerie was clear from the start of our talk, she was not alone in the founding experience. And naturally, for the Shandaken Community Gardens, the quote “many hands make light work” doth spring to mind! But of course, I knew her background played a valuable part in this greater symphony of productivity. So far, there are 26 fertile soil beds liberated from piles of hefty rocks at the Phoenicia school property, six tidy compost piles, some really nice deer fencing, sponsored insurance, an array of fruits and veggies soon to be nurtured to harvest, one handsome garden shed, plans to educate adults and kids in the coming season, donated veggie rows for the Reservoir Food Pantry, and most importantly; a working collaboration with her surrounding community to get down and funky in the soil. So, to track Valerie’s journey toward all this-- what’s our first stop? Here, growing up in her urban home, Valerie had on-going exposure to seeing things grow from soil to table. Her mother tended figs, raspberries, and other fruits and vegetables in their backyard garden. Valerie relates, “It wasn’t really a conscious part of my life. I was usually indoors with my books. Now, my mother makes fun of me because I never wanted to go out and help her.” Later as a young adult, another profound component touched her life. 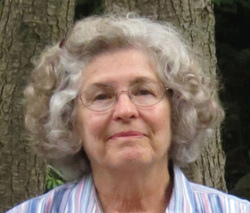 She began to partake in sharing communal meals at Vassar College. There, she lived two years in a 20-member student co-op, where she and her housemates often cooked food together. She remembers, “We would go and buy produce and other food in bulk. Students craved a family experience of eating together where people are sitting around one table talking to each other.” Listening to Valerie, it was apparent these early years of buying, preparing, and enjoying meals with friends would lay a deeper foundation toward a desire to participate on a community level—with food as a basic, powerful bond. She began to gather incentive for her life direction. On the flip side, she felt she had spent too much time indoors with her studies, so she decided to actively pursue some new, life-changing values. Soon after graduation, Valerie began working with CSA farms—Community Supported Agriculture. In this program, community members buy shares in a farm, rather than buy food from a farm stand or storefront. Weekly, the shareholders pick up a box of their grown produce. Valerie observed the cutting edge benefits of CSA, “It’s very economical—the farmers know they have money for seeds, and to start the season.” She also related how the consumer knows what’s happening with their food firsthand; if the weather has affected crops, or what crop is currently in abundance, or even if deer have invaded the vegetable bed! The CSA network reveals ways farms can bring the community directly into their sphere. Ultimately, for consumers, a casual appreciation is developed through direct exposure to their farmers. For a college grad making choices toward working the land, this exposure put more knowledge and tools in an even more focused context. Next, Ms. Linet took her journey and learning level to an entirely different state—Colorado! The very first farm Valerie worked on was a raw milk dairy situated in the Rocky Mountains. There, she gained a variety of experiences working with animals, goats, cows, pigs for slaughter, draft horses trained to plow and bring hay, turkey, and laying hens. Valerie also learned how to milk cows, and assisted with yogurt and cheese making. This particular summer in Valerie’s history was a dynamic introduction to authentic farm living. But, as for many of us, soon the Northeast summoned her back home. She then landed in Boston and started to cultivate her own personal garden. However, briefly, life threw a bit of a curve. She discovered there was lead in the soil, and had to change gears. When it comes to the process of growing food, she learned on a very personal level that anything could happen! Soon thereafter, she joined Americorps and started assisting with literacy education for children. She began to integrate lessons in food, farming, and water. Valerie defines environmental literacy as, “Having a working knowledge of food and farming, where food comes from and why it’s important to be a participant in the process, and be a steward and protector of food as a resource.” As an Americorps member, she was able to facilitate this program over a summer, and truly loved working with kids. With this new teaching component, and the accumulation of more skills, bit-by-bit, she gained ever more incentive toward community gardening. Now, let’s go full circle, over to upstate New York. Back to familiar stomping grounds, Valerie worked on Phillies Bridge Farm near New Paltz. There, she is took a role as a grower, and educator. It was at this juncture that Valerie began educating in a more formal way. Along with the Education Coordinator who was on board, they brought in groups of children, and with the help of volunteers they facilitated a “Farm Camp.” Here the children were taught how food is grown and cultivated. Educating others, children and adults, became an even more important piece in Valerie’s greater experience. Working and collaborating in this farm environment would next usher in a new, unprecedented level of experience. She chose to welcome a life that offered a profound spiritual commitment. The Monastery garden property naturally has a great deal of clay in the soil. As a synchronistic preface for her work there, a previous resident had doubled the size of the growing area. When Valerie came on board, she found herself in a position to usher in an unprecedented era of nutrition and food production by slowly improving the quality of the land. Her role as gardener created a great learning experience on various levels. Valerie relates that there were other people, who in the context of their spiritual training would also gain plenty of experience in the garden with her. She explained why this time was such a rich experience, “It brought together so much of what was happening in my life that was very special. Also, the garden is such a cycle of life and death and can be cruel. Mice and other things have to be killed. Japanese beetles were destroying strawberries so I would hand pick them and put them into soapy water. One person who was vegetarian, had to make a choice of whether they could support this.” In listening to her talk, it was easy to understand that cultivating empathy, the honing of people skills, and listening to different perspectives, all were succinctly present during her time at the Monastery. The inevitable cycles of creation and destruction in the garden provided many direct insights. It became obvious to me that her time in this unique, working environment added a whole new level of understanding that would become extremely useful later on. Now, our safari through Valerie’s life choices is almost up to date. But there’s one last stop: Boiceville, NY! In 2008, Valerie and Jeffery did indeed move to Boiceville. Very soon, she started to miss gardening a great deal. But in her life, the idea of a community garden still hadn’t presented itself. She knew she wanted to be with people in a certain way. She knew that wonderful things could happen in a garden atmosphere with others, she related, “There’s so much discovery and so much opportunity to be surprised and to be filled with a sense of natural wonder.” She started a garden at her own house, but she found she really wanted to be part of something bigger. She eventually met Alma Rodriguez with Cornell Extension, and was offered the opportunity to help form a steering committee: Enter the Shandakan Community Gardens project! The beginning core group included Cameron Williams and Gloria Waslyn, who carried plenty of passion and fresh ideas to the table. From the start, everyone had concerns about their local community accessing fresh food, individually, and through local pantries. A larger group soon melded together with plans to sculpt a greater vision of the Garden. Slowly, a firmer foundation began to fall into place. Bright spots began to percolate, such as acquiring non prof status through Catskill Mountainkeeper, and donations such as the shed and labor for fence installation. Valerie encourages people to visit the website shandakencommunitygardens.org and view all the collaboration involved with Shandaken Community Gardens, “You can see how many people have come on board, and a list of their names and what they do.” The committee hosted a pre-season caretaking gathering on April 20th. All were welcome. The 2014 Hurricane season officially begins June 1. This information is just so much trivia to many. However, people in the Ulster County pantry world are a little antsy. It’s understandable. We, those of us who live in this area, haven’t gotten over the last two hurricanes. Mold and rot continue to advance on residential and commercial buildings at a fast clip while funds for repairs and replacements of damaged/destroyed buildings and vehicles have yet to become a reality for many. There are deniers who won’t wrap their heads around another hurricane. After all, two horrendous weather events, each producing floods of Biblical proportions are enough. Right? Reservoir Food Pantry volunteers know what we’re up against. After all, we were the deniers after Irene and learned our lesson with Sandy. Now we prepare to feed those affected by the next “big one” – whenever it hits. We’re working feverishly: planning, scheduling, and purchasing food to distribute to people. We’re filling food boxes to distribute. Each contains a three-day supply of canned food for one person. If you contact us and have four people in your household, you’ll receive four boxes. Packing the food is easy. Distributing the food is easy. It’s the getting part that’s hard. For that we need money to buy the food we put in each box. Please send a check to Reservoir Food Pantry, P.O.Box 245, Boiceville, New York, 12412. Or get us a gift certificate at the Food Bank of the Hudson Valley. Call 845-534-5344 and tell the person who answers the phone that you want to donate money to the Reservoir Food Pantry, agency number 2539f. That call will get us the most food for the money. Food at the Food Bank is only sixteen cents per pound, making a can of soup cost sixteen cents, for example. If you access the Food Bank of the Hudson Valley through www.foodbankofhudsonvalley.org, the donate button looms large on the right side of the first page of the website. You can’t miss it! Again, please specify your donation goes to agency 2539f, reservoir Food Pantry. And, finally, to personally choose the disaster relief foods you give to the Reservoir Food Pantry, drop them off at the Olive Town offices or at the Community Bank in Boiceville. However you choose to share, none of your donations will pay for rent or salaries. And, most important, this disaster food will be in the hands of the victims before any other food sent in from outside sources. We opened the Reservoir Food Pantry on September 9th, Bonnie, Sean, Prasida, and I. In a very short time we found ourselves feeding over 25 homebound households. The amazing thing is that we didn’t even really tell anybody what we were doing! They just found us. The truth is here’s a huge swath of Americans in our area who are largely ignored. It’s the poor, and their ranks are growing. More Americans are living at or below the poverty level since President Johnson declared his war on poverty in 1964. Back then, poverty looked very different than it does today. Right now, today, 1 senior in 4 in our area doesn’t have enough to eat. There are many pantries in Kingston. There are 4 pantries in Saugerties. Woodstock has 2. Bearsville has one brand new pantry. Phoenicia has a pantry. Olivebridge has a pantry. Beyond that, there’s a real pantry desert until Margaretville area. It’s the goal of the Reservoir Food Pantry to offer food to the people in the Reservoir area who currently aren’t being served by a pantry. We feel that the need is great. So far, we’re seeking a permanent space for our pantry, your pantry. We are applying for a 501(c)3 designation. We are constantly scrounging for food. Hunger has many faces: unemployment, catastrophic illness, disability, homelessness. Your support is essential to our success. Anything you can share will be gratefully accepted. Every donation is gratefully received. We thank you. The Reservoir Food Pantry is not funded by churches, grants, or government agencies. A core of volunteers staffs the pantry. Food is provided by donations from local businesses. The donations come from Boiceville IGA, Bread Alone Bakery, Holy Ascension Monastery, Migliorelli Farm, Sunflower Natural Foods Market, Walmart, and individual donations from individuals. Volunteers drop empty grocery bags at doorsteps of selected homes each week. We’re proud of the way everyone has responded to the call of the new pantry in these times. Everyone is pitching in so that our neighbors have enough to eat. Many of these people are homebound. Some of them are seniors whose social security checks no longer cover expenses. Some are newly unemployed. Others are struggling to stay in their homes. Our numbers are rising weekly. All of us working in the pantry work from a base of gratitude. We appreciate the abundance of food available in this country. We feel there is no excuse for anyone in our country to go hungry. In 1987, President Reagan ceased federal funding of mental health programs. Living in San Francisco as a young artist, I was astounded at the sudden duality between the have and have-nots in my community. News articles, charity events, and grass roots groups, such as Food Not Bombs, quickly reflected where Federal money was no longer being spent. “Will Work For Food” became a new national meme. The West Coast’s mild climate had always attracted the homeless population and the numbers quickly climbed. Those not used to intense poverty not only witnessed it, but now interacted with it in their daily lives. And in our current times, depending on the season, many Americans are now accustomed to the city’s homeless peering up beneath shopping bags and baby strollers. We’re all aware that people are still struggling -- perhaps more than ever. This January 31st, HUD, the Federal agency for housing and urban development, asked social services workers and emergency feeding agencies to take a "point in time" tally of persons without permanent shelter. For starters, in regards to climate, we’re all acutely aware that New York is not California! So, save for temporary public shelters-- where do the homeless go when it’s 9 degrees outside? If these people are surviving in hidden communities, or “couch surfing” house to house, is there any hope beyond a bon fire and a blanket? Where are these folks --right now? With frigid temperatures here in the Catskills, it doesn’t take rocket science to deduce that most are hidden away from the streets. To help out with the survey process, our pantry donated large quantities of toilet paper and cereal to be distributed to all those who were locally counted. Assessing the specific needs of everyone we serve continues to be our ongoing focus. For our rapidly growing client base, we keep a special record of specific dietary needs for each person. With each household’s nutritional needs noted in our records, our pantry regularly delivers to the homebound in and around the greater Olive area on a weekly basis. Beyond agencies and their protocols, people need people. We can all pull up our boots and hit the ground by simply being observant. And then we can take some action and change someone’s life for the better. If you know someone who needs support—make a call on his or her behalf, or physically hand that person information of how to contact a local resource organization. That’s what we’re here for. So, bottom line? Now more than ever, as costs escalate and the economy threatens to spiral, we need to look out for each other. The Reservoir Food Pantry is deeply grateful, and sincerely hopes, that we can count on you! Driving our cars down tree studded neighborhoods around Olive and it’s four hamlets, we can all catch a curious glimpse of how other people live. From our speeding windows, we’ll see front doors, porches, gardens, and weathered lawn adornments. And while weaving down roadways can make for a fun drive, a quick view of our neighbor’s homes may or may not offer a clue of the stress the individuals inside might be feeling as winter begins. American economic woes have taken a deeper turn with new food stamp cuts, a whopping 23.3% unemployment, and inflation cutting into everyone’s wallets—no matter the income. What usually results as the final cut to make ends meets, most ironically, is the most basic variable to flourish and function: food. If there are children in the household, of course this adds an even greater stress for families and single parent homes. Moreover, living in rural areas comes with a higher price tag—less opportunity for employment, burning more oil in our furnaces and gas in our cars, all of which can easily result in going without staples for basic survival. But in spite of desperate conditions that seem outside the scope of human control, it’s times like these when the people that populate our towns really show their heart and intelligence. What is the invisible network that exists beyond the façade of front doors? People’s urge to help each other, as we witnessed with the devastation of Hurricanes Irene. The bottom line being this: that New Yorkers in general, and especially those in Ulster County, refuse to allow --what is truly-- preventable suffering-- in their midst. We just won’t put up with it. So what is the reality? An abiding network of generosity that grows like the deciduous trees we all enjoy in our beautiful region. At our current, temporary location of The Reservoir Food Pantry, we are consistently stunned and relieved at the myriad of ways local residents come through to keep our shelves stocked. Our special “Items of Dignity” section has donated non-edibles, such as shampoo, toothpaste, toiletries, and soap. Incredible volunteers such as Bob Otto, with his booming heart and voice, who tirelessly work our Grocery donation drives, inspire shoppers to donate soup and cereal so our Pantry can continue service to clients through the winter. This network of energy is indeed a fantastic and beautiful thing to behold—but, has we are all acutely aware, food and other basics are part a destructible cycle that demands constant replenishment. A shelf bursting with canned vegetables one week can be bare and depleted in another week or two. But we have strong faith in the consistent sprouting of our local Generosity Tree. We know that if you’re reading this right now, you’re probably a fruitful branch that will-- or has -- supported individuals who require assistance, now, and in the future. Let’s stand tall together and help keep this beautiful, strong Generosity Tree growing! We have full trust and faith that this amazing network of support will continue to grow and flourish through future tough times. From one budding branch to another: thank you for caring!